A friend of mine posted this image to Facebook and I thought it was so true that I wanted to share it with you all as motivation for success in 2013. 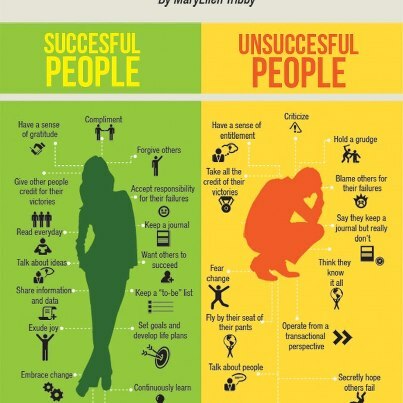 Listed are the characteristics of both successful and unsuccessful people. I recognize these statements as being SOooo true. Do you see aspects of yourself in both of these lists? If so, moving from one list to another isn't all that difficult…. you just need to decide to change your attitude. To your success in 2013 and Happy New Year! Thanks Ros,you know what that posts like these is what keeps me motivated,thanks for a great post and have a great one this year! Really liked what you had to say in your post, Successful vs. Unsuccessful People, thanks for the good read! I’m a mixture of the two sides and will work to change those couple of character flaws that are holding me back. Thanks for sharing this! Nice post! Thanks for keeping it simple, sweet and non-preachy. That makes it easier to benefit from. This is so true Ros. I admit when I was younger I tended to fall more into the negative category. I guess at the time I didn’t know any better, only that it didn’t feel very good and didn’t lead to positive results. I’ve since radically changed my habits and thinking around and it has made an incredible difference in my life. It’s a much better way to live! I just read the latest email that you sent to me about the difference between successful and unsucessful people.You know when something like that is pointed out it can really stir the grey sells into life.I am guilty of some of the failings,at the same time i have a desire to succeed,however the problem for me is in trying to strike a balance between reading what is relevant and becoming bogged down with information overload.I have all kinds of pdf information on affiliate and internet marketing including your very own super affiliate hand book,also, ebay and amazon.I know that i will never read all of it,sometimes i feel like deleting all of it and starting over,but i just can`t do that because i don`t want to get rid of the good information that is in there.I suppose it boils down to a lack of concentration. I definitely had traits from both lists which makes the information doubly important to me. I put the information into a powerpoint slide and posted on my facebook page. Thanks! I have missed you. Thanks for the great post…it’s time for some motivation! 2012 sucked. I’m still working on many of the unsuccessful characteristics but without becoming a Buddha over night, it’s a tricky task. Although a very worth while one. I’d like to highlight a few of the best characteristics IMO to aid progress. So often, not being able to brings these into a persons perspective can be extremely restricting and narrows the senses.